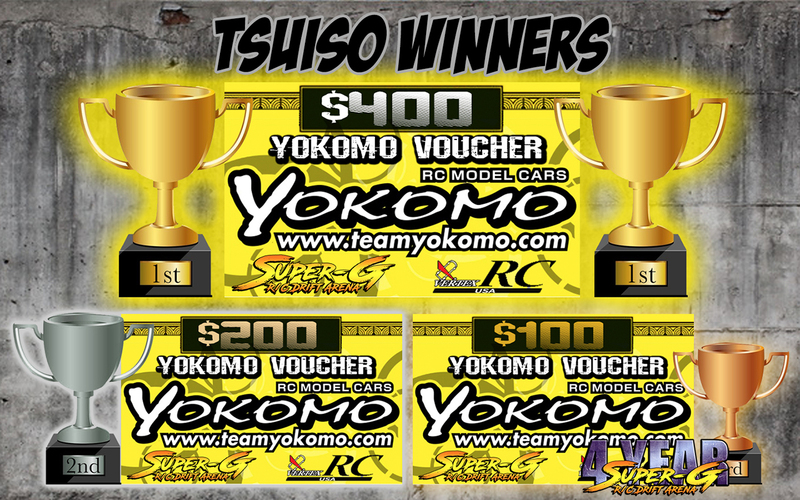 4 Year Bash – Tsuiso Battles and Sesh Sponsored by Yokomo!!! 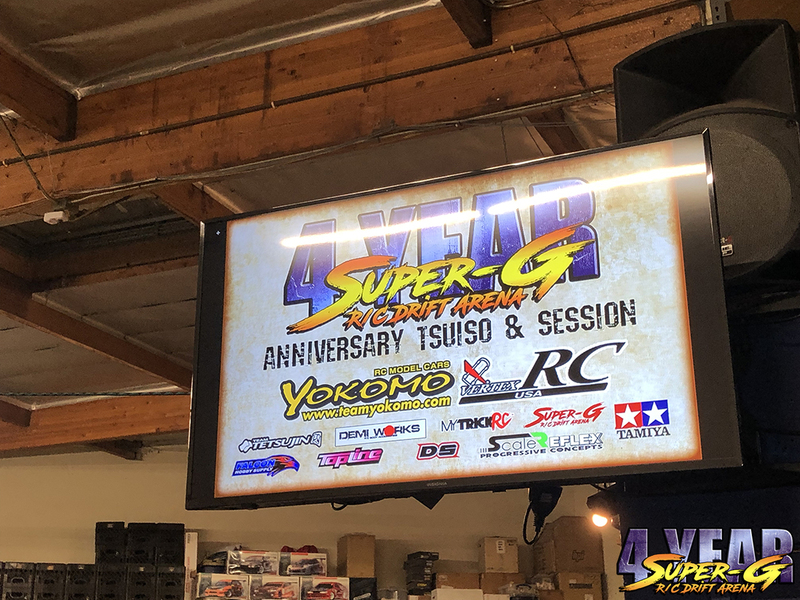 This past weekend Super-G was celebrating our 4th Year. 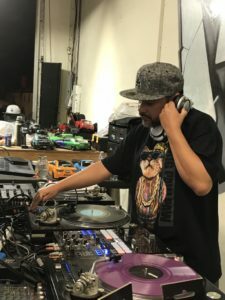 We decided to do a 2 day event so we could launch a SuperTwin Team Battle Competition and still have a Tsuiso Battle and Session at the main event. 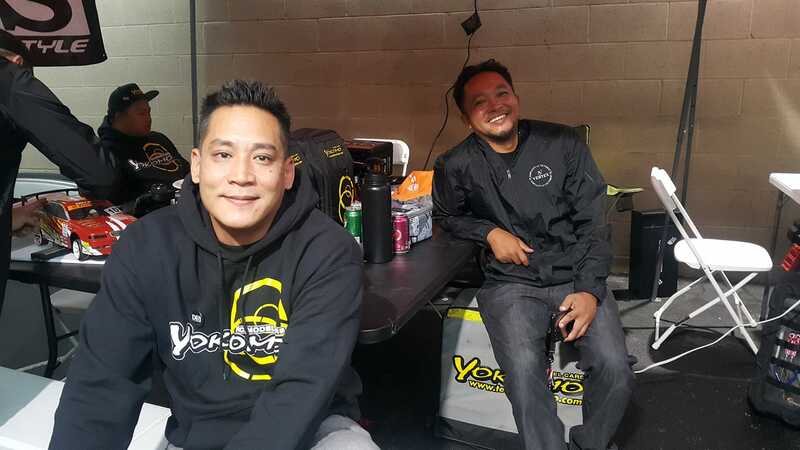 Yokomo / Vertex RC stepped up the main sponsor for the event, donating $400 – 1st Place, $200 – 2nd Place, and $100 – 3rd Place Yokomo Vouchers! This ensured everyone who’s anyone on the West Coast was here to take part in the Tsuiso Battles and claim their prize! 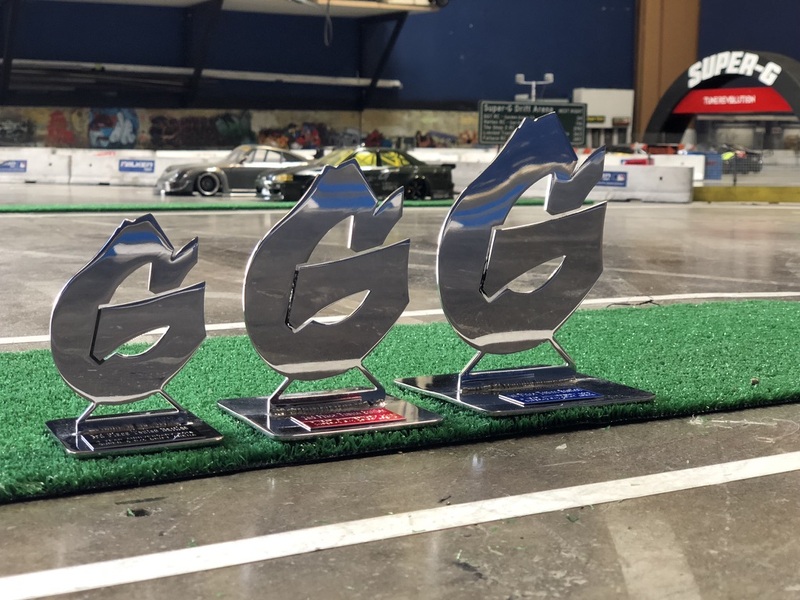 The custom fabricated Super-G hardware to go home with the winners! We opened at 4pm to give the competitors adequate time to break in the spec tires for the comp. 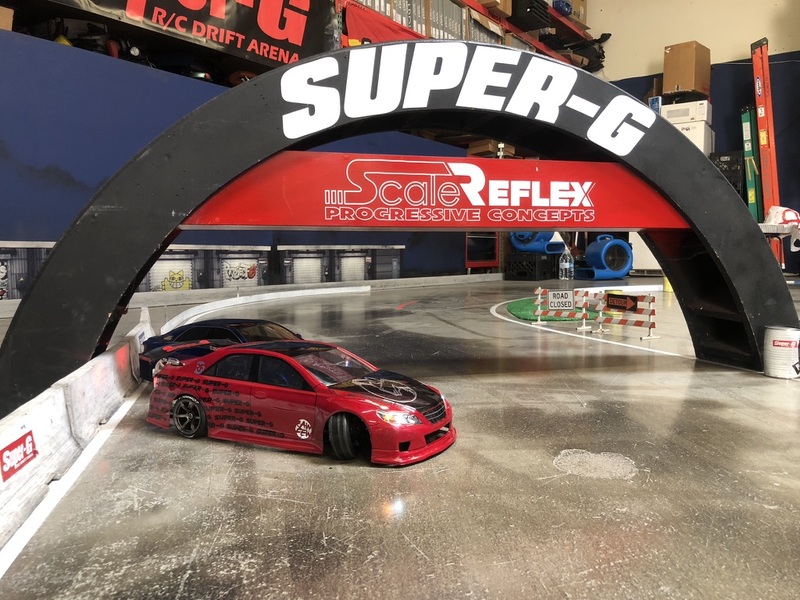 Yokomo DRC tires are the choice for Super-G R/C Drift Arena, so it only made sense to provide a rear set for each entry to ensure a level playing field. Well, as level as possible I suppose. A weight limit of 1100g measured at the rear wheels was also imposed, as well as the standard regulations regarding the chassis. Before we even got started, Chito and Ethan had surprised everyone with Pizza! This helped take the edge off before the comp and allowed many to keep practicing instead of heading out to grab a snack before the comp. Thank you Chito and Ethan! Again, Shaine Collins, Colin Chambers, and myself Steve Fujita were judges for the event. We feel very comfortable with these judges since we all share the same goal, to make sure we make the best and most accurate call possible. We have been judging together for the past 4-5 months (Maybe longer) and I can say without hesitation, I have not see one hint of any bias. Match this with the Super-G Replay System, and you have yourself a pretty strong double check on the calls. Anytime a replay is called for by the judges, the entire crowd, competitors included, can watch exactly what the judges are reviewing. After getting everyone signed in, it was time for the Single Run Qualifying. Each competitor would have 2 chances to run the course solo, while being judged on 3 main points: Line, Angle, and Style. Standard Competition Rules applied. Any contact with barriers, spin outs, or 2 wheels off track counted as Zeros for the run. To make it easy, as long as the competitor was able to get points on the board, they were automatically qualified for the Tsuiso Battle Competition. Basically, make it through the course without crashing or spinning, and you are in! There were 33 competitors registered. Of the 33, 30 qualified for the Main Event. The Top Qualifier of the night, Kevin Motter with a score of 29 of a possible 30 points! On a side note, Kevin has gone undefeated for the past 4 Comps IN A ROW! He now has taken TQ. The top 3 qualifying spots for the event were all Super-G Locals, Kevin Motter- 1st, Hao Huang – 2nd, and a 4-way tie for 3rd – Aydin Angulo, Ethan David, Manny Campalans, and Mikko Yang. This set the mood for the competition and gave a good indication of who to keep your eye on. Congratulations to Kevin Motter for TQ 29/30! 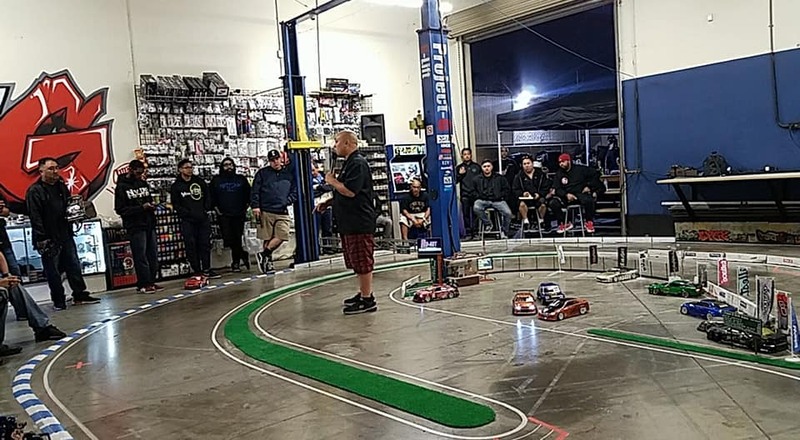 Of the 30 competitors who qualified, 28 were piloting Yokomo YD-2 Chassis. 2 were driving MST RMX 2.0s’. 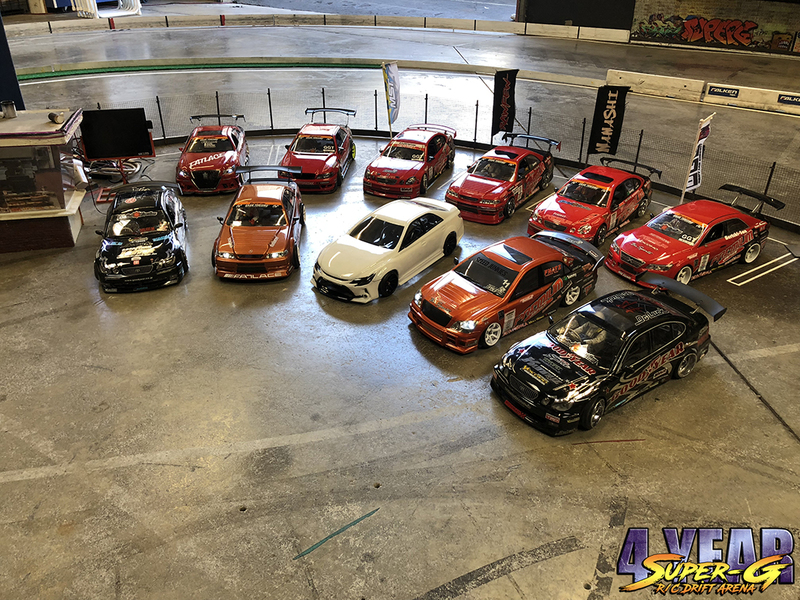 That’s a pretty high number of Yokomo YD-2s, and a good indicator of which way the scene is going, at least here on the West Coast. 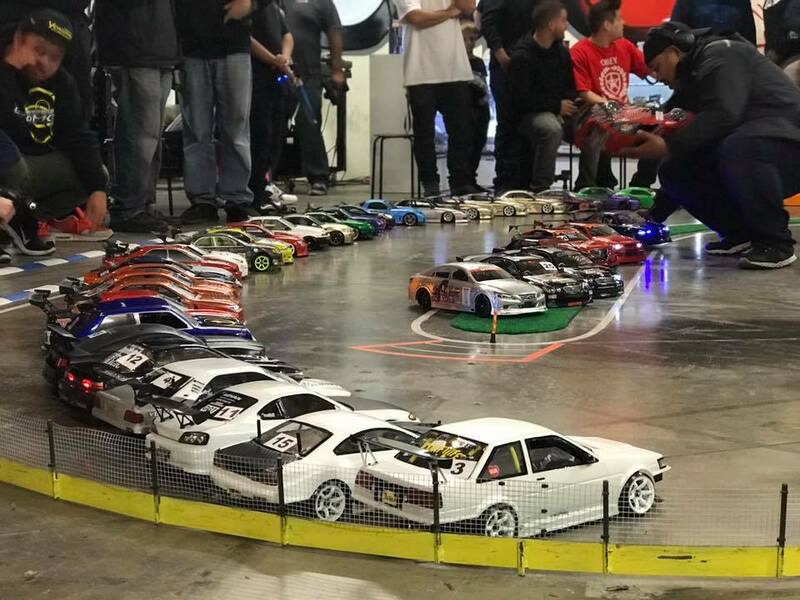 Coincidentally, Yokomo was the main sponsor for the event, so it only seemed fitting to see so many Yokomo chassis filling the competition. Due to the number of competitors, we went with Single Eliminations. Each competitor would be paired up for 2 runs before being judged. Each taking turns leading and chasing. Each of the leads and chases would be compared to decide a winner. The winner of each battle would advance, while the loser would be eliminated from the competition. 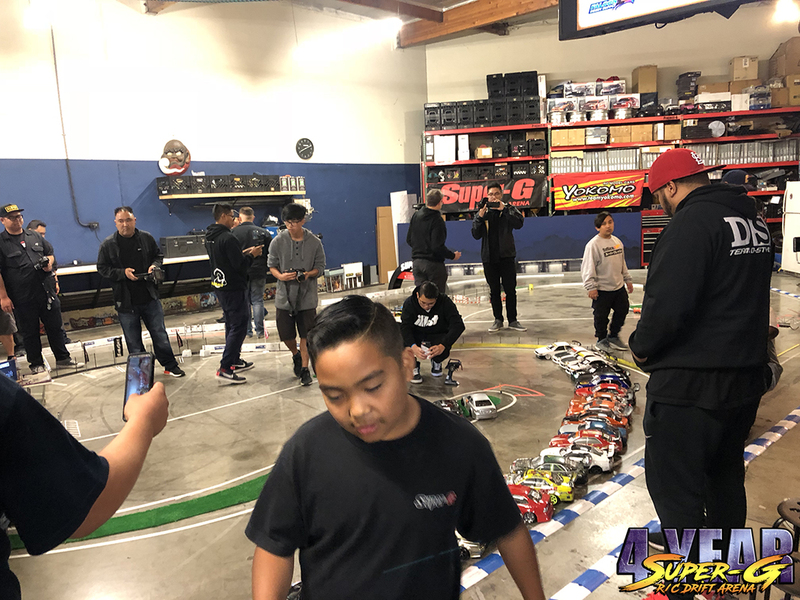 The battles were fierce and it was obvious from the very first round that everyone showed up to show their skills and take a piece of the Yokomo Purse! One by one the competitors were eliminated as the competition progressed. It came down to the top 4, Ethan David vs Mikko Yang for 3rd and 4th Spot. 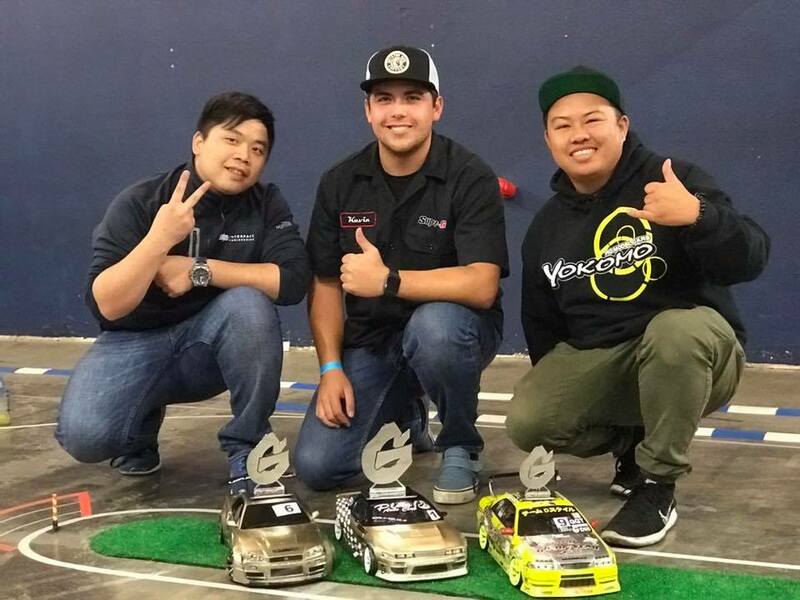 A slight miscalculation by Ethan on his lead run allowed the seasoned professional, Mikko Yang to take advantage and easily secure his 3rd Place spot on the podium, and the $100 Yokomo Voucher! Then it was time for the battle for the top spot. Not only for the bragging rights, but also for the grand prize of $400 Yokomo Voucher. Second place would be going home with a $200 Yokomo Voucher. Both these drivers worked hard all night to get to this point. Going into the first run, Kevin was on the Lead, Hao was on the Chase. As they entered the sweeper, Kevin was about as deep in as anyone could get, Hao was right on his door applying that pressure one would expect in the final round! As Kevin initiates for the hairpin, Hao was just a little too aggressive, putting him into Kevin’s door and basically locking in the Zero for his chase run. Kevin went on to complete his lead with amazing style and skill, dragging his rear bumper mere fractions of an inch off the Super-G K-Rails. Everyone was holding their breath, but he pulled it off with a smile. The second run, Hao was on the Lead, Kevin on the Chase! Hao answered back at Kevin’s Lead with a strong lead. Kevin rubbed the ScaleReflex Cone at the Hairpin, but it wasn’t enough to knock it down. The rest was history as they say. Hao’s Lead Run was strong, but not enough to take down Kevin’s Lead and Chase! 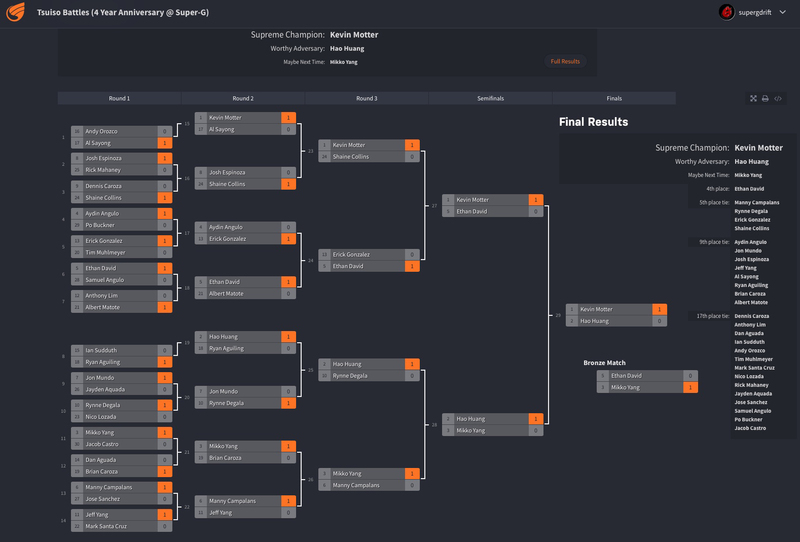 Hao comfortably locked down 2nd Place, securing the $200 Yokomo Voucher! Your Winners of the 4 Year Tsuiso Battles! After the Competition we went right into the Raffle. 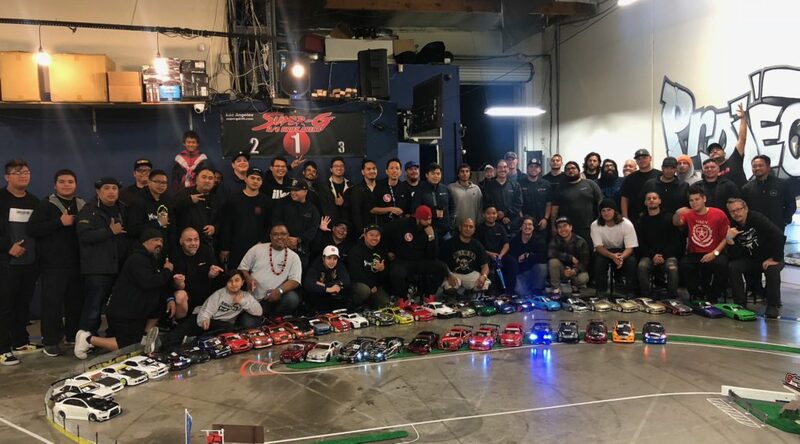 We want to give a huge thanks to our sponsors, Yokomo / Vertex RC, as well as Scale Reflex, Demiworks, MyTrickRc, Tetsujin, Tamiya, Gensace, Falcon Hobby, and Topline for all the great raffle prizes. 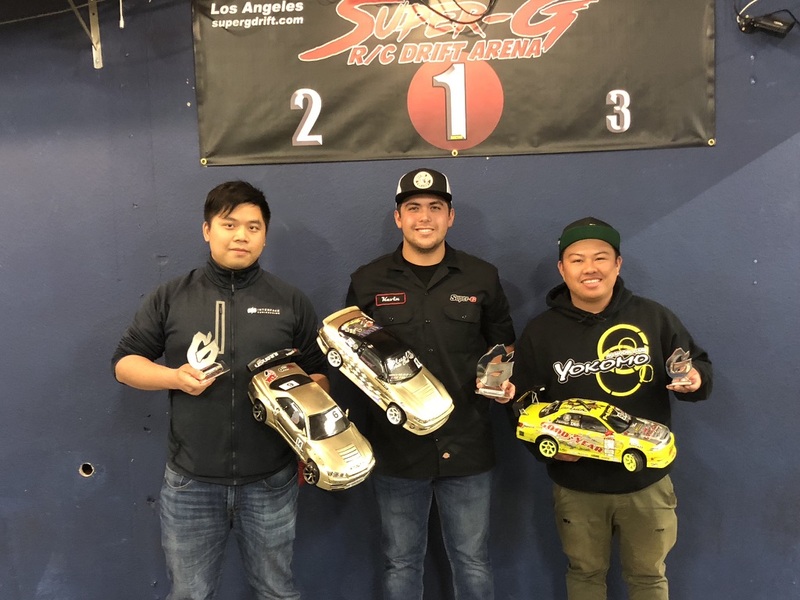 The Grand Prize was a Yokomo YD-2s w/ Gyro donated by Super-G R/C Drift Arena! It seemed only fitting since Yokomo was bringing it with the impressive purse. After all was said and done, we gave away over $2500.00 in raffle prizes! During this time, we had open session and the tandem trains were insane! So much talent under one roof, it was inevitable. After the raffle, Peepsho (Mark Santa Cruz’s Bro), Ashknuckles, and Mike C jumped on the decks for a scratch session! Since we went over time, it ended up being a lot shorter than expected, but it was a important part of the celebration! Mad thanks to Peep, Ashknuckles, and Mike C! Dan , Tony, and Al from NorCal’s Limited Traction / Team Bushido were slaving away on our Taco Cart and BBQ all evening, so as soon as the comp and raffle were finished, there was a TON of great food waiting for everyone! Carne Asada Tacos, Dogs, and Watermelon! I was planning on jumping on the grill as soon as we finished the comp, but these guys saved me for the second time this weekend! Thank you guys, it makes a bigger difference than you can possibly know. 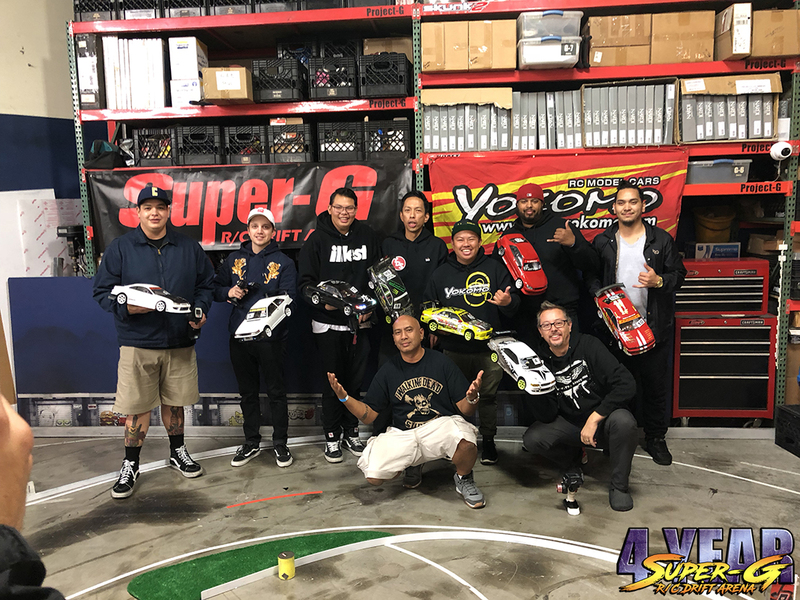 I was really happy to see Dat and Josh from Vertex RC / Yokomo USA in San Diego, as well as Jeremy Meyer from Driftwell in CenCal Randy Beard from RareArtsUSA, and Anthony Requena from DriftNutZ making the trip to Super-G to celebrate with us! Thanks for the support guys! 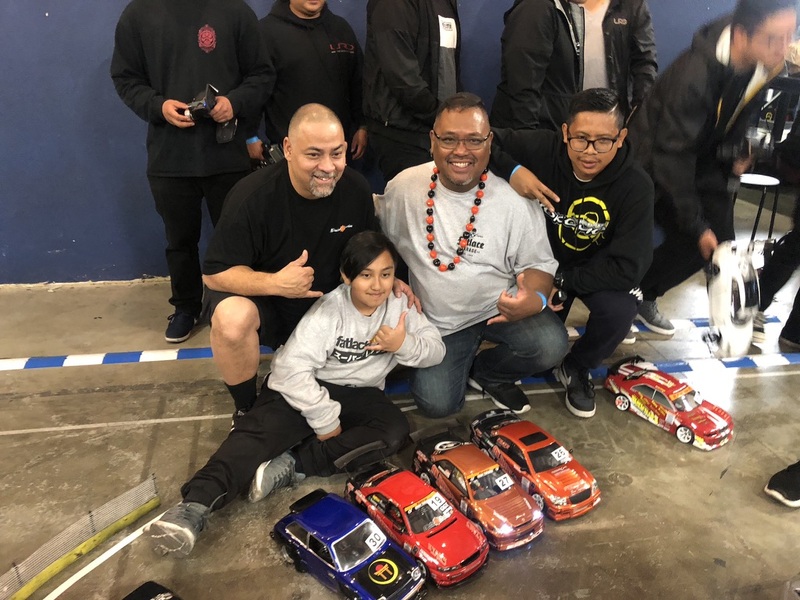 It means a lot when the owners of local (or not so local) shops take the time to share in these important moments and mingle in the RC Drift Community. 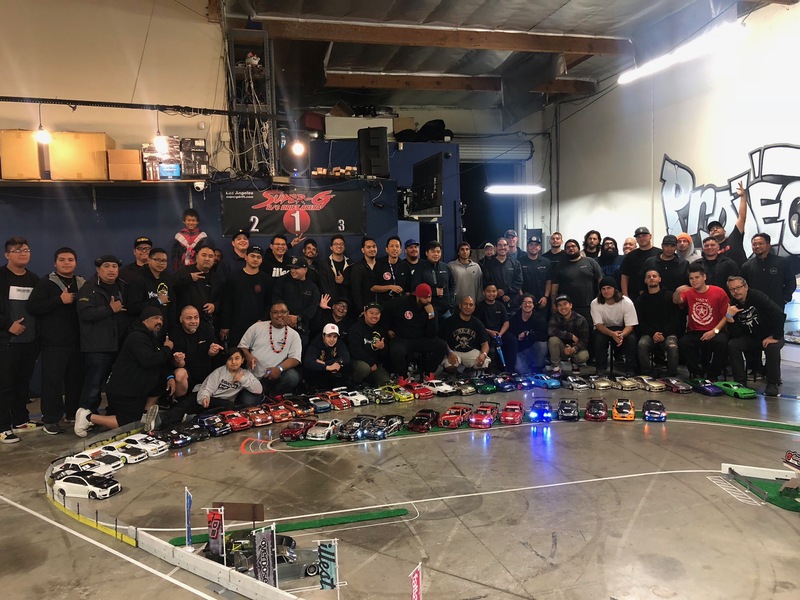 We would also like to extend a huge thanks to NorCal – Limited Traction, Team Bushido, SpeedJunkies, Fatlace Crew, San Diego – Vertex RC, SoCal – SwiftSuns, Team DStyle, GGT Crew, DRFTNDM, DriftNutz, RareArtsUSA, and RawFew. 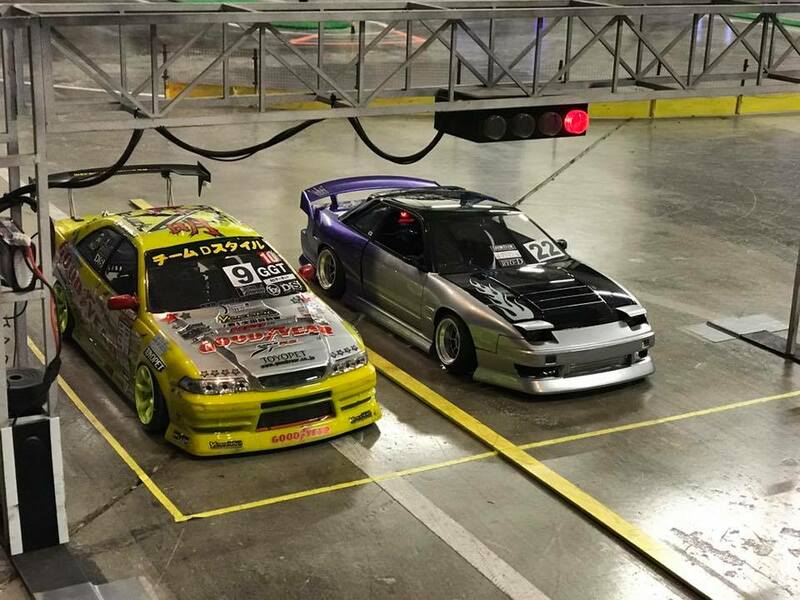 This weekend marked an important time for Super-G R/C Drift Arena. We have come from a small PVC Drift Track in front of our shop, Project-G, to converting our workshop to a full on R/C Drift Arena. We have implemented weekly Fun Competitions. Set up a standardized set of rules for Fun Competitions. Set up a standardized set of rules for Real Competitions. Finally, we are developing and streamlining our Super-G Replay System. 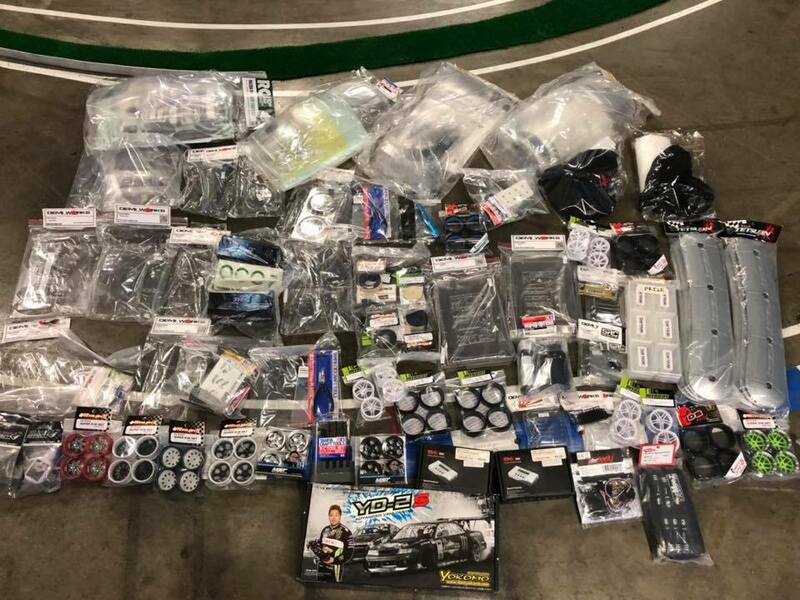 All this because of the love and support the R/C Drift Community has shown us, and because Joe and I have always loved R/C. Joe has been into the R/C Drift Scene from it’s grassroots days, myself, about a year before Super-G was established, but R/C in general since I was knee-high. Thank you all for the great 4 years! We look forward to pushing even further in the upcoming months and years!